It’s true that age is just a number. However, the effects of age are as real as the years of life that we have experienced. There are many reasons for sudden joint pains and mobility difficulties. These difficulties could be reduced through many methods, such as taking supplements or a maintenance medication given to you by your attending physician. However, there is another way, a more natural way and it involves a popular, relaxing, and at the same time strengthening exercise called yoga. Breathing – The art of yoga practices correct breathing that aids you on your way to relaxation. Relaxation – Even if we’re retired seniors, we still get stressed over a lot of things. And sometimes, the stress haunts us to the point of no sleep. When you’re a senior trying to find relaxation, but just can’t seem to find it, it might be time to try and exercise. The breathing that yoga teaches helps calm down your brainwaves, and helps you get rid of the stress aiding you on your way to relaxation. Sleeping – Exercise has been seen as a way to help you sleep better. It helps balance hormones in your body helping you to sleep. Deep breaths taught in yoga also help calm the brainwaves that cause you those sleepless nights. Joint Pains – As a type of exercise, yoga helps enhance the pains you feel in your joints as you age. It helps decrease the inflammation that’s causing you to feel those joint pains which in turn helps you keep walking painlessly. Flexibility – One thing we lose aside from our original hair color when we get older is our flexibility. You may have noticed how without practice, even young people find it hard to touch their toes or bend in certain positions. This is similar to our condition as elderly adults with the loss of our flexibility. Yoga helps you regain your flexibility and along gives you more health benefits than you could have expected. 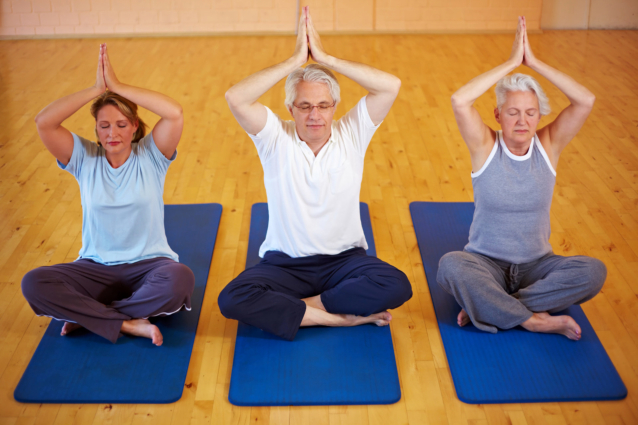 These are only five benefits of yoga for senior citizen because there are actually even more! Elderly citizens need more care and attention than most people think. There are many areas to look into, and health is one of these areas that we, at Caring Nurses Services, look into. As a Home Care Agency in Bel Air MD that provides Skilled Nursing Services, we help senior citizens take care of their health by encouraging them to exercise and at the same time assisting them with their daily living activities through the services we provide. For more information about our services, call us at 410-638-5588 or visit www.caringnurse.org. This entry was posted in Home Care and tagged Elderly citizens, Exercise, Home Care Agency, Skilled Nursing Services, Yoga for Seniors. Bookmark the permalink.